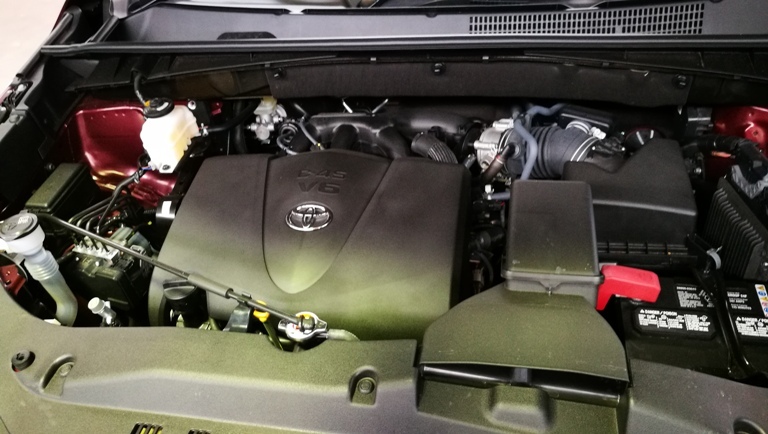 2019 Toyota Kluger Grande and GXL. | | A Wheel Thing. 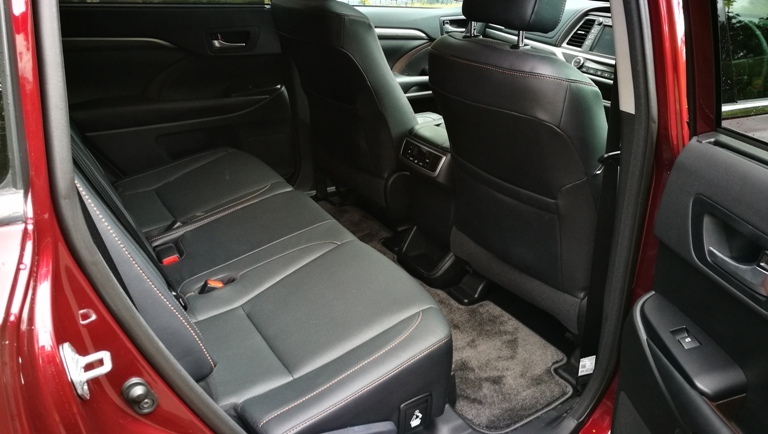 2019 Toyota Kluger Grande and GXL. In a previous life, AWT attended the Perth launch of a newcomer to the Toyota family. 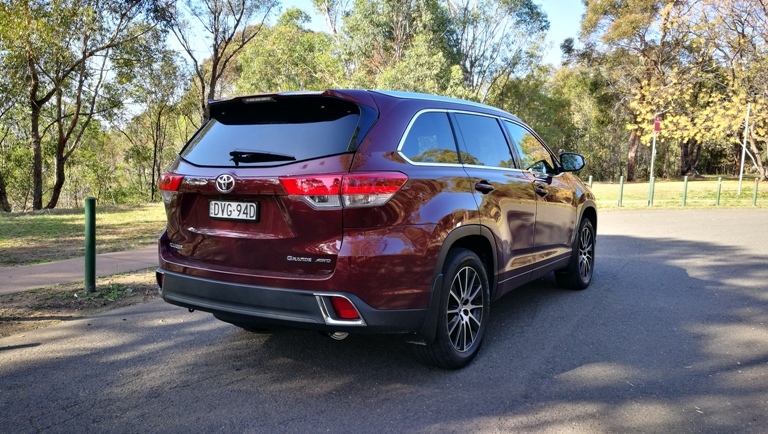 Called Kluger, it was a squarish, slightly blocky, petrol only, mid-sized SUV. 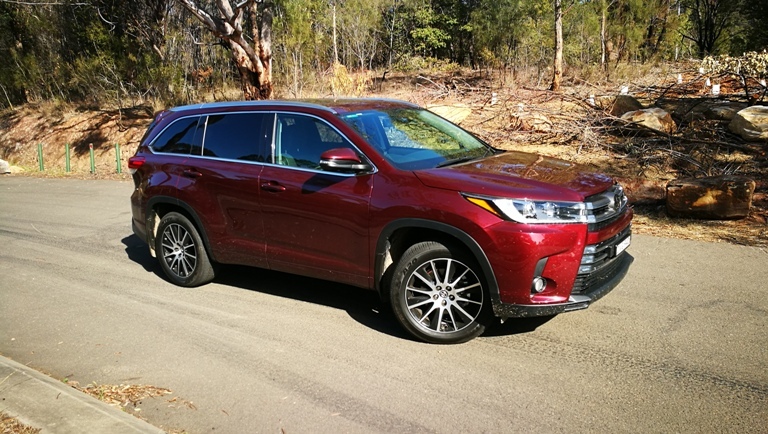 Fifteen plus years later the Kluger remains petrol only, still has a squarish and blocky design, and has grown to be not far off in size of the Land Cruiser. AWT spent a week with the top of the range Grande and mid-level GXL, with the Grande seeing the countryside whilst the GXL did what it’s designed for. The urban lifestyle run. There’s a big price difference though, with the GXL in the mid $50K range and a huge $10K less than the Grande. 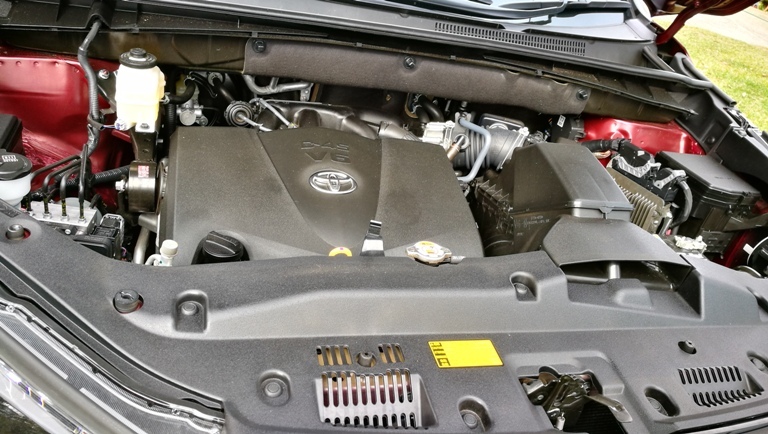 The standard engine is a 3.5L V6, producing 218kW, and a surprising 350 torques. Surprising because, in context, it’s the same amount as that produced by a turbo-charged 2.0L petrol engine. As a result, urban fuel economy is less that inviting, with the GXL not seeing a figure below 11.0L per 100km at any stage. The Grande is a different story; the dash display didn’t appear to show a consumption figure however we managed a reasonable half tank from the lower Blue Mountains to Cooma. This consumption stayed consistent from Cooma to Bega, back to Cooma, and then Sydney. Sole transmission option is an eight speed auto. 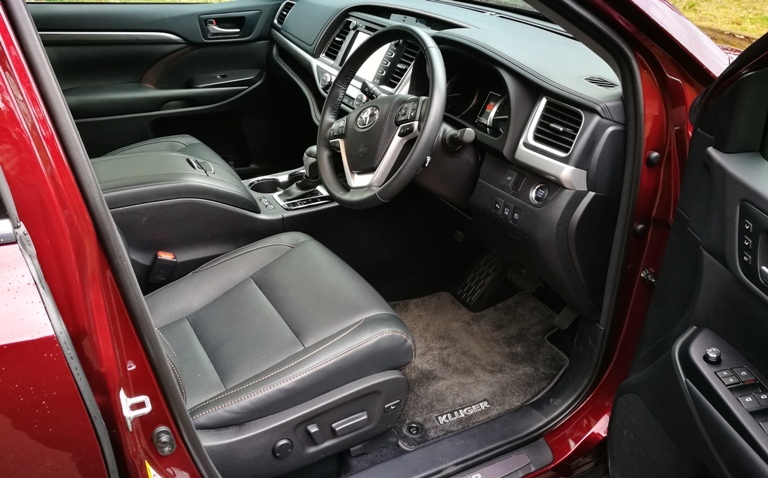 In the GXL this drives the front wheels and the Grande is an AWD system, driving the fronts but splits torque rearward on demand. The driver’s dash screen shows this in a graphic, and it’s kinda interesting to watch from the eye’s corner when starting forward, be it a hard or soft launch. The Grande suffers in comparison to the GXL in this area. When punched the GXL will move with a decent measure of alacrity and will chirp the front tyres. 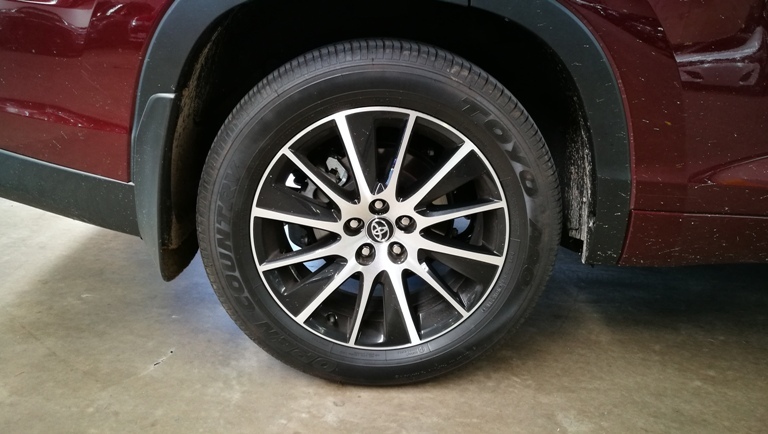 The GXL around town also has a slightly better ride, with a more supple appeal thanks to the slightly higher sidewalls. The Grande is sluggish off the line, with a feeling of needing more effort to have both front and rear wheels gripping. 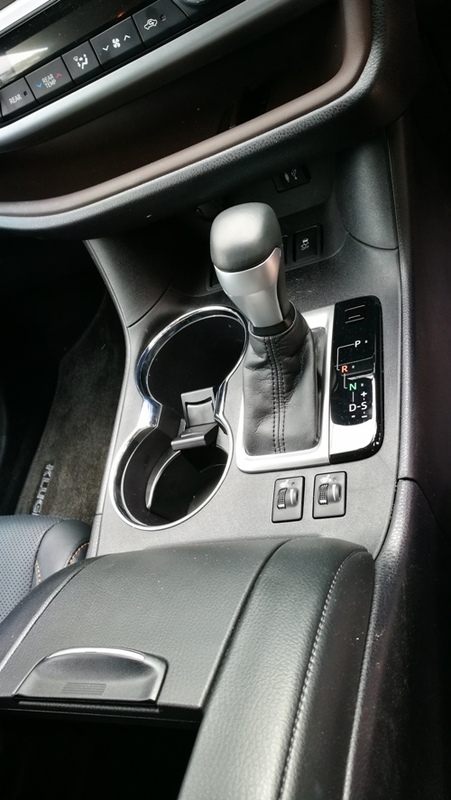 The eight speed auto in both is…..adequate, to be polite. Cold they were indecisive off the line, and when warmed up were somewhat archaic in their change feel. Think the early four or five speed autos when one cog was finished and there was a yawning gap until the next one engaged. An exaggeration of sorts, yes, but needed to paint the picture. The weapon of choice for the six hour country drive was the Grande over the Holden Calais Tourer. According to the junior team members of AWT it was the roof mounted blu-ray player (complete with SD card input) that won the contest. There are four wireless headphones and they sound fantastic. 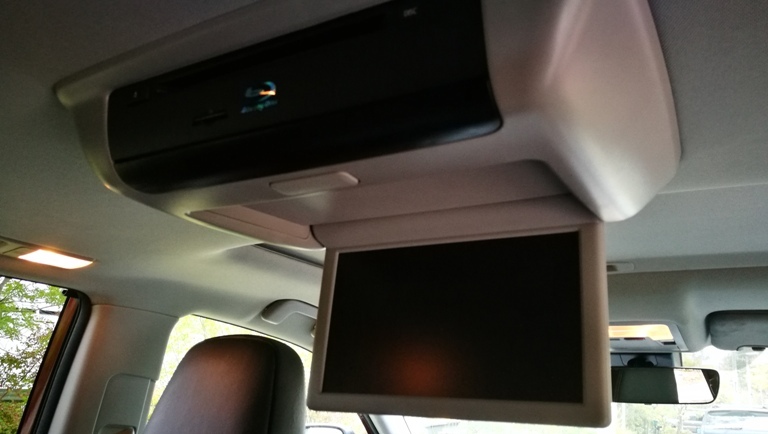 The screen itself, naturally, isn’t blu-ray quality but the fact Toyota offers that kind of playback is a bonus. 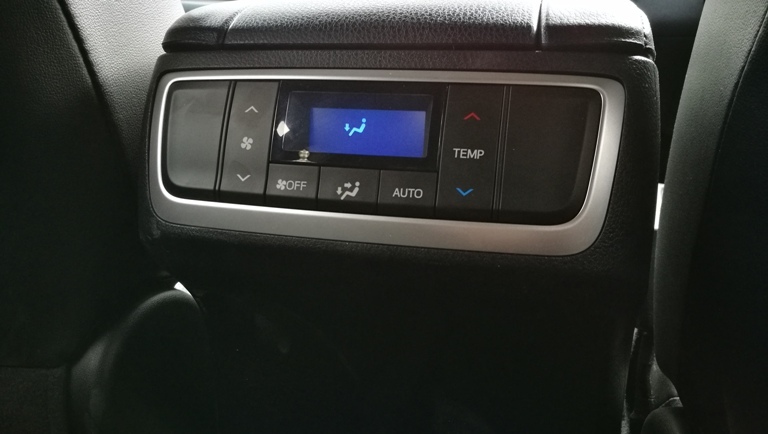 Having rear aircon and the controls at the rear of the centre console is also a bonus as the controls are both fan speed and temperature independent of the front seats. The middle seat rows are tilt and fold which allows access to the simple pull-strap operated third row seats. Or one could enter via the power operated tailgate. 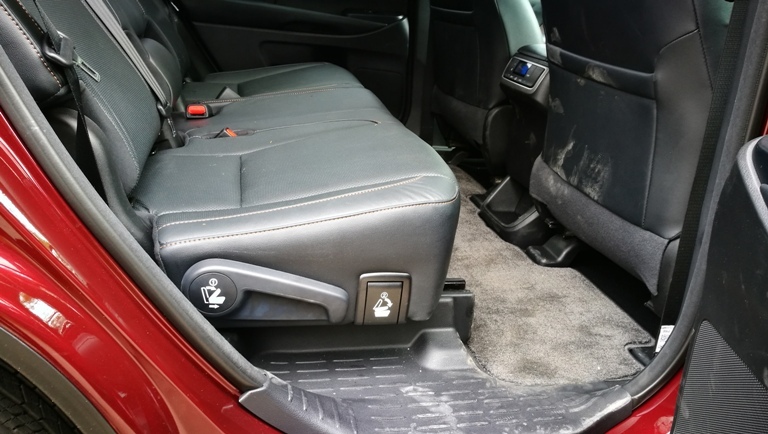 The Grande has an extra family friendly feature for those that use wireless charging smartphones too. 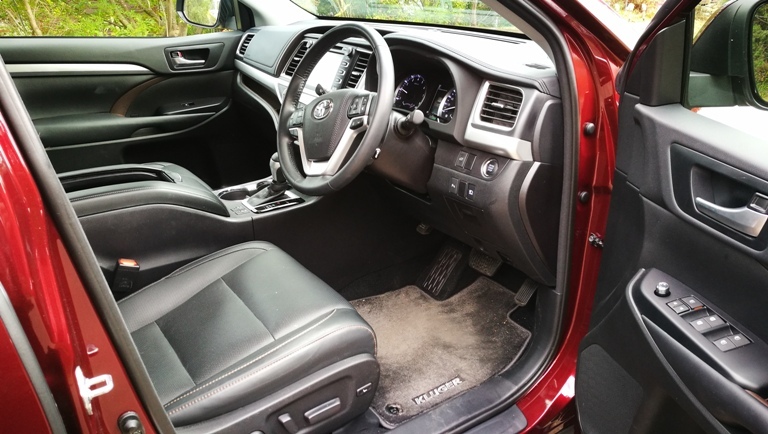 Adding to the family persuasion is a plethora of cup and bottle holders throughout the cabin plus a DAB or digital audio broadcast tuner. The latter had an oddity in that it would pick up signal in areas some other cars don’t but when it lost signal it was almost painfully slow to regain it. 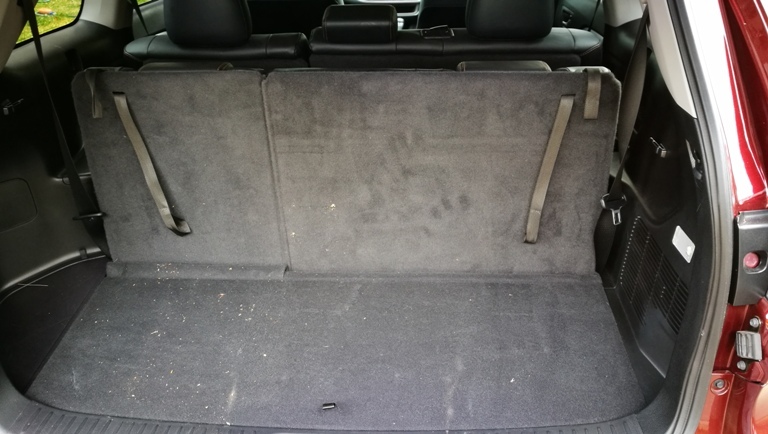 Actual fit and finish in the Klugers is starting to lack visual appeal. The dash design is somewhat chaotic with blocks rather than an organic look. Somehow, after a while, it seems to work. Of note is the centre of driver’s binnacle info screen. 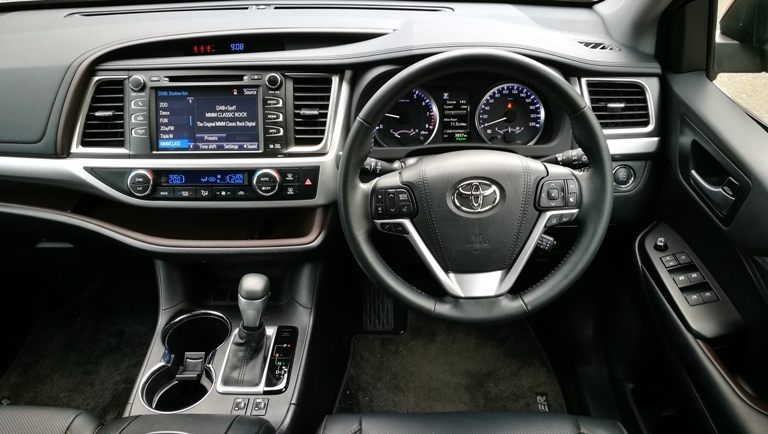 In typical Toyota fashion it’s initially a little confusing to look at, but once a few flicks of the tabs on the tiller have been performed, the info such as which safety aids are being used or how much traction is being apportioned, becomes easily accessible instinctively. Powered seats make finding the right seating position to read the screen easy, and in the Grande they’re both heated and vented via a pair of utterly simple to use roller dials. They’re coloured red and blue left and right of the centre point and have three settings to choose from. The GXL ditches the venting and goes to slightly less attractive roller dials to activate the heating side. The actual driving position is comfortable in the seats but the tiller felt a bit narrow to the fingers. All round view is very good and with broad side mirrors the Blind Spot Alert system was almost not needed. Almost. On the highway heading east from Cooma to Bega, some of the roads narrow and there are opportunities for a lack of safety of this form to lead to issues thanks to drivers that believe themselves to be better than they are. Suffice to say the Blind Sport Alert system can be a life saver. Safety wise there’s really not a lot between the Grande and GXL, with Toyota‘s Safety Sense. Pedestrian friendly collision warning, Rear Cross Traffic Alert, and Lane Departure Alert, and seven airbags are aboard. The Grande turned out to be a decent country tourer. Under way and at cruising speed, it ticks over at the freeway speed at close to 2,000rpm. 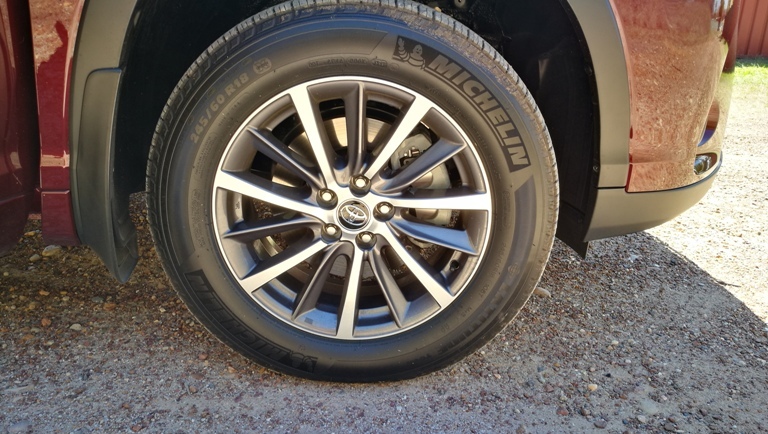 Toyo supplies the (specially supplied for Kluger Grande) Open Country 245/55/19 rubber on the Grande and Michelin the 245/60/18s for the GXL. Both exhibit a sometimes uncomfortable measure of road noise, especially on the coarser chip surfaces south of Canberra. The dearth of torque at low revs was always apparent though. That peak amount is at 4700rpm, and it was enough at times to feel the gearbox move to seventh to eighth to seventh in order to try and utilise what was available. It was also noticeable when uphill runs or an overtake were required, with a steady drop through the ratios. On the road the steering was never comfortable though, with a somewhat numb on-centre feel and with more weight than expected. 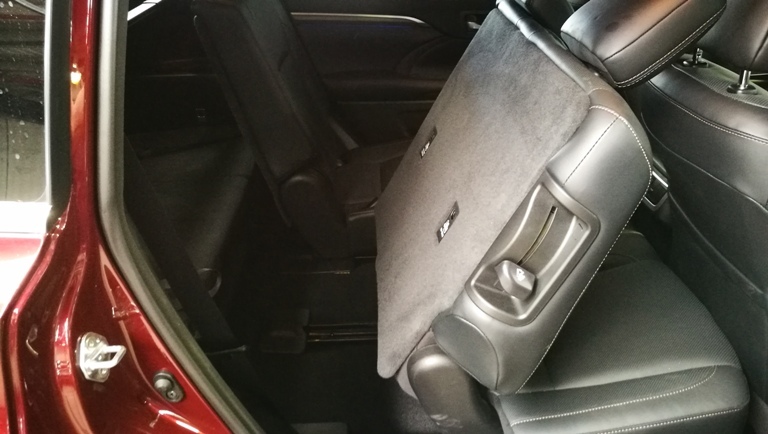 However it doesn’t tax the body and with a stop every two hours or so, a driver can exit the car feeling a bare minimum of driving fatigue. The exterior design is also starting to look out of date in comparison to both Toyota’s own design ethos and in respect to the opposition. It’s still a squarish, angular look, which at least matches the dash. The front features an inverted triangular motif and isn’t overly chromed. Eagle-eye headlights with LED driving lights balance a similar look at the rear. Alongside the latest from Korea the Klugers look heavy, tired, and nowhere as slippery. 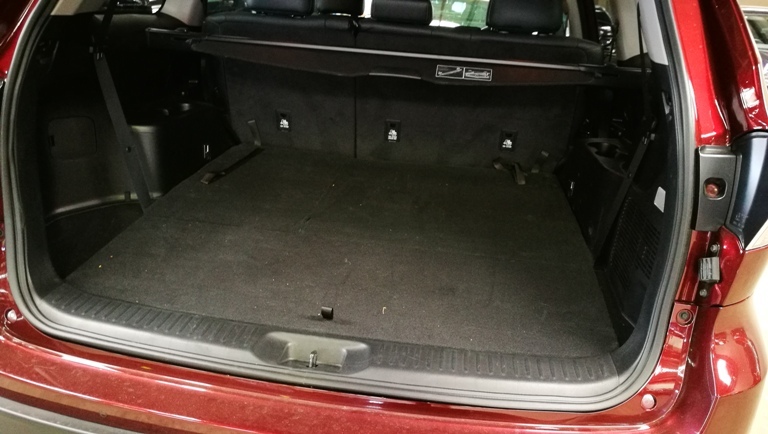 The Klugers also come with just a three year or 100,000 kilometre warranty, another area that other companies are rapidly changing. Roadside assistance is a 24/7 owner service, however. 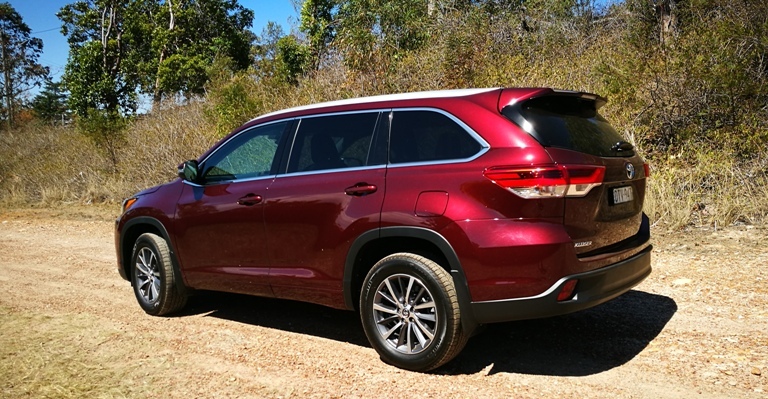 Be the first to comment on "2019 Toyota Kluger Grande and GXL."